Pixar is arguably one of the greatest storytellers of our generation. Over the years, they’ve won 13 Academy Awards, 9 Golden Globes, and 11 Grammys. Effective storytelling involves a deep understanding of human emotions, motivations, and psychology in order to truly move an audience. Luckily, storytelling is something we all do naturally, starting at a very young age. But there’s a difference between good storytelling and great storytelling. I recently stumbled across Pixar’s 22 rules of storytelling — here are the top six we can all learn from. Great storytelling is about taking a piece of the human condition (so things like birth, growth, emotionality, aspiration, conflict) and conveying it in a unique situation. One way you can do this is to pull apart the stories you like. Break down every little element about what you love about them. Those are real feelings you’re having and you have to recognize them in detail in order to tell a great story yourself. In other words, self knowledge and awareness are at the the root of all great storytelling. You are part of the human condition and people will relate to that. 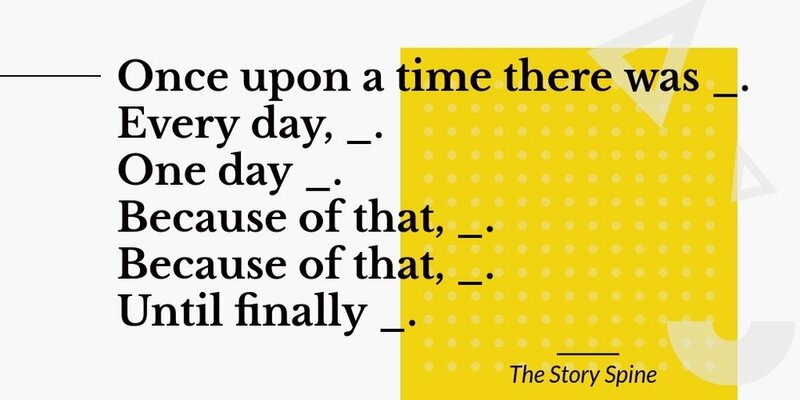 One of my favorite ways to develop a compelling story is to use “The Story Spine” formula created by professional playwright and improvisor Kenn Adams. Pixar has used this story structure to create so many films we know and love today. Once upon a time there was [blank]. Every day, [blank]. One day [blank]. Because of that, [blank]. Until finally [bank]. Give the Story Spine a shot to help develop a truly unique story to tell. Why must you tell THIS story? What’s the belief burning within you that your story feeds off of? What greater purpose does this serve? What does it teach? That’s the heart of really great storytelling. By crafting a story that you are passionate to tell because it serves a real purpose, your stories will have bigger impact on the world. I think that gets lost a lot of the time. Believe it or not, people want to root for you (the main character). AND they love a good underdog. This might seem straightforward but it’s worth keeping in mind anytime you’re creating a story. Pixar explains that we as the audience admire a character for trying more than for their success. In other words, it’s more about the character’s journey than it is their actual destination. When your character is battling against all odds, facing adversity, or their back is against the wall, well then, you have yourself the makings of great story. In our modern society, for example, everyone loves a good “rags to riches” story. How many times has Forbes published an article about the fearless entreprenuer that dropped everything, almost failed dozens of times along the way, yet still managed to create a multi-million dollar business? Give the people an unexpected hero to root for. Psychologists generally agree that there are six basic emotions: anger, disgust, fear, happiness, sadness, and surprise. If you ever watched the Pixar move Inside Out, you’ll recognize these emotions as characters in the movie. The more you understand how/when your own emotional levers are pulled, the more you’ll appreciate how that works in other people (and the more you’ll be able to hone those emotions in your stories). Consciously being to recognize these various emotions in yourself —and think about the “why”. Why are you feeling a certain way? How might you be able to take the “why” behind your emotions and tell a story? Continuously question yourself in order to understand your own emotional reactions to stories so that you can learn to tell more authentic stories that reach and move people where it counts. We’ve all seen the classic “fairytale” storyline: a helpless princess in need and a charming prince swooping in to save the day. What makes modern stories compelling are when our perceptions of reality are challenged or changed in some way. Creators like Pixar and Walt Disney use animated movies as vehicles to address real-life phenomenons, issues, stereotypes, and norms. Movies such as Brave, Coco, Tangled, and Moana help us to understand and reflect on big, human-centered topics that we might not otherwise take time out of our day to think about. Many times those topics or themes are surprising and unexpected, leaving the audience thinking about the story well after it is over. If you’re stuck on coming up with something truly unique, Pixar recommends to get rid of the 1st thing that comes to mind — and then the 2nd, 3rd, 4th, and 5th. Challenge yourself to dig deep. We as audiences know a good story when we see or hear one. Have you ever watched a movie or read a book where you had to keep asking yourself (or someone else) what was happening in the plot? As creators, we naturally want to include as much information as possible in our stories. We want to pack the story full of characters and plot twists and dialogue. And often times we might not even realize that we’re adding layers that don’t need to be there. While you as the creator may feel like you’re losing lots of valuable stuff, it’ll set you free in the end and will allow your audience to get lost in the narrative. One way to find out if your story is easy to follow is to tell it to a friend or family member who has never heard it before. Watch their face as you read it and try to see where they pause and what questions they might have.